Of all the mythic STAR WARS characters, the one most like us is ironically a robot ...C-3PO. He frets; he worries; he fusses; he's prone to anxiety; he talks a great deal; he makes mistakes and is loyal to his friends. As depicted in StarWars: Episode I, C-3PO is the creation of a nine-year old prodigy, the young Anakin Skywalker, who creates the robot from discarded scrap and salvage to help his mother. Anakin is lured to the dark side and eventually becomes the evil Darth Vadar. But C-3PO, as played by British actor Anthony Daniels, retains his cheerful, chatty enthusiasm throughout all six Star Wars films. C-3PO is the loyal companion to the more practical droid, R2-D2. ArToo has the solutions, but can only beep. ThreePeeOh is not the ultimate "fixer" like ArToo, but he is a robot with unique abilities that well serve his human companions. He is a protocol droid - fluent in 6 million binary languages, which is a big help in breaking secrets transmitted in Imperial code. And, his golden sheen is enough to convince the Ewoks that C-3PO is a "god", and to ally with the Rebels against the Evil Empire. Wherever we find him in the Star Wars story, C-3PO is always working to "bridge the gap" between humans and robots, or humans and other creatures. ThreePeeOh is the ultimate social robot and inspires scientists to create real robots with fluent language and communication skills. 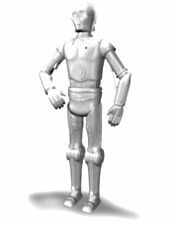 Loyal friend ...engaging droid ...cheerful communicator ...a robot with which humans can truly identify! C-3PO, we salute you on your induction to the Robot Hall of Fame! Photo is ©2004 Lucasfilm Ltd. & TM. All rights reserved.